"P.A.F. on steroids" tone. Used for classic rock, heavy rock, funk, punk, R&B, metal and drop-tunings. Beefed up Patent Applied For tone for a hard-driving, kickin' sound with the right balance of power, sustain, and distortion. 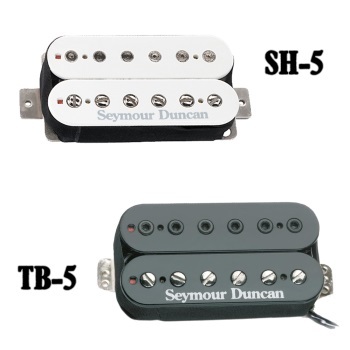 This pickup cuts through with a distinctive high end and midrange attack. The ceramic magnet and custom coil design give it compressed dynamics, an enhanced harmonic structure, and a punchy bass. Perfect for dropped tunings without "mushing" out. Comes with four-conductor hookup cable. Recommended for bridge position. Often a Duncan Custom is paired with an SH-1 '59 in the neck for bigger P.A.F. tones in the bridge and vintage-correct P.A.F. tones in the neck. For balanced and warm instruments. Works especially well with rosewood fingerboards. Nickel or gold-plated cover. Trembucker. 7-string version. Colors (humbucker spacing).